Folding scissor gates are a compact, easy and affordable solution for residential and commercial properties interested in upgrading their security or that want to have greater control over entrance and egress. Made from durable metals – and constructed using interlocking lattice of steel, polycarbonate or aluminum – folding scissor doors come in a range of sizes, colors and installation options depending on the doorway or entrance in question. We have installed folding scissor gates in a myriad of applications, including open-air malls, office buildings, schools, storefronts and the exterior framework of residential garages. There are multiple benefits of using folding scissor gates as a part of your home or business security system. 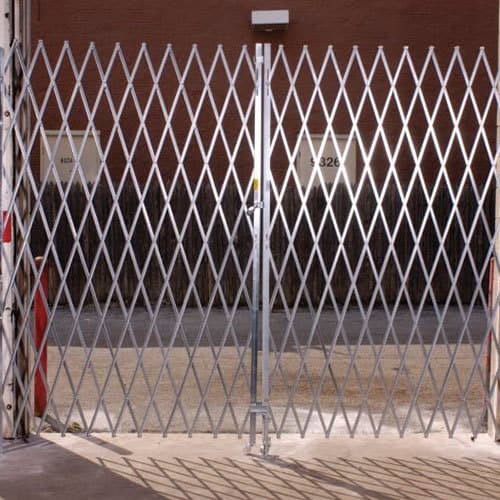 The folding mechanism means there is no extra space to accommodate for, as there is for most swinging security gates. Once unlocked, scissor gates are easy for anyone to operate. They are low maintenance and when kept clean and properly maintained, they slide fluidly open and closed without any significant amount of force required. Your business transitions from closed to open in a matter of minutes. Once they’re opened, some gate styles pivot up to 180°, ensuring the bulk of the apparatus is moved out of the way for passersby, forklifts and other mechanical or equipment passage. Blocking a storefront means blocking visual access from potential customers who drive or walk by. With folding scissor gates, brick-and-mortar storefront owners know their windows and business contents are safe from the average thief or vandal, but that the storefront still contributes to the neighborhood’s curbside appeal and that potential customers will be tantalized by the business interiors through the windows. Most commercial HVAC systems are designed with the assumption that airflow is consistent and continual throughout the building. Solid rolling or sliding doors that weren’t accounted for in the system design can stymie forced air systems, resulting in higher energy bills and heavier wear-and-tear on the HVAC system. Blocked airflow overnight, or for significant portions of the day, also make it more difficult to restore blocked off spaces to a comfortable interior temperature once the business or blocked off areas are opened back up. Because scissor gates are designed with a latticework pattern, air can move effortlessly between the two spaces, and the same holds true for security, task and ambient lighting as well. Folding scissor gates are exceptionally cost efficient when compared with standard steel rolling door options, which makes them a smart choice for smaller business owners, or business owners on a budget, allowing them to spend valuable liquidity elsewhere in their business. You can select from a range of styles and colors. Scissor gates come in standard sizes to fit both single and double-door entryways. They are also offered in standard commercial sizes for taller and wider doorways. Business owners have control over which side of the gates open, close and lock and pivot, if necessary. While the gates are often seen in a standard silver or black, but they can be ordered and finished in a range of colors that fit your building’s architectural palette and/or your branding. Folding scissor gates also come in portable options, most often used in schools, medical facilities and other public buildings. These portable options are easy to roll up and store easily when not in use but can be assembled within minutes, anytime and anywhere inside the building. They allow employees to block particular hallways, annexes or offices, and 6-foot extensions are available to extend the main gate if needed. Interested in purchasing or replacing folding scissor gates for your Bay Area business or garage? 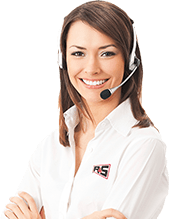 Contact us here at R&S and we’ll be happy to drop by and provide a FREE, on-site estimate. We also perform professional maintenance and repairs for existing scissor gates to maintain your warranty and ensure your gate delivers on its multiple promises. (925) 671-7606.